Brand refresh for market leading Aggregate manufacturer. Established leaders in the Aggregates field, Hanson required a brand revitalisation project for their Tuffgrip product in order to better position its selling points and lead product status in the target market. We instigated an initial period of significant qualitative market research, which then provided the insight to generate a list of marketable ‘values’ for the product which had proven themselves through the research to be truly appealing to both influencers and direct decision makers. Next step of the brand strategy was developing the message and building the face of Tuffgrip. 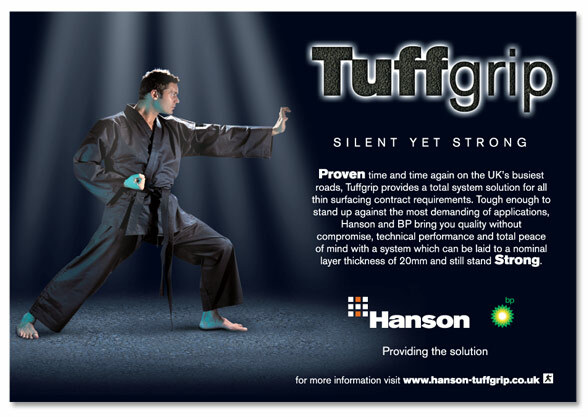 Capitalising on the products inherent technical performance features and mirroring the product values of confidence, skill, strength and performance, we selected a karate figure to represent Tuffgrip in marketing communications collateral. Working through the campaign programme to delivery we worked alongside Hanson, before launch to market, undertaking a number of internal roadshows across the UK introducing the new brand personality to internal teams. The ‘silent but strong’ campaign was rolled out to agreed timescales and budgets, developing a range of materials which included advertising, web, direct mail and exhibitions. Ultimately, the our strategic approach successfully revitalised the brand and regained market leading status.